How To Maintain A Golf Course Pond | GeoForm International Inc.
Golfers may differ on their opinion of water hazards — some may like the challenge, others not so much. They all share the same view, though, when it comes to a golf course pond that’s covered in algae, smells and attracts a hive of insects. That’s why it’s critical for golf courses to maintain their ponds. The most attractive golf courses are usually the ones that contain an abundance of sparkling lakes, ponds and other beautiful water features. This makes golf course pond maintenance a top priority for groundskeepers. Timely sediment removal is a critical step for ensuring golf course waterbodies remain in pristine condition and make a day on the links more enjoyable for the players. While many golf courses take a chemical approach to cleaning their ponds, this method costs thousands of dollars each year and can even result in an overbearing chemical smell, which doesn’t appeal to golfers either. So, how else can you make your golf course pond cleaner? With aeration and dredging. Ponds require oxygen, which aeration works to deliver. Without oxygen, sludge builds up. When the mud and muck break down, it consumes the oxygen left in your pond. Limited oxygen then lends itself to the growth of algae, which results in a lake that smells and lacks visual appeal. Mechanical aeration works by transferring oxygen through air-to-water contact. When people think of aerating their ponds, their first thought is fountains. While they do qualify as aerators, most don’t have the power and thrust that’s required to aerate. Surface aeration: Floating surface aerators disrupt the water surface and displace water, which allows for air-to-water contact. Electricity powers these aerators. Subsurface aeration: An air compressor delivers oxygen to your pond, which leads to the formation and rising of bubbles to the surface. This technique is recommended for ponds that are at least 8 feet deep. Some courses opt to use aeration alongside chemical treatments. Ponds with an excessive amount of sludge and sediment can turn into swamps with ease. Dredging is a tactic that prevents that from happening by cleaning out that muck. It can also widen and increase the depth of your pond, as sludge can become as deep as 10 feet. A dredge for golf course ponds is the basis for dredging. The machine works by pumping the water and sludge out through a submersible pump and into a series of bladder bags or dewatering tubes. These bags have minuscule holes, which let the water escape but keep the muck inside. Golf course pond maintenance often benefits from both dredging and aerating, especially if your pond needs an extensive amount of assistance due to mismanagement. With proper management, you not only deliver a positive golfing experience to your patrons but also reduce the time and expense of maintaining your pond. The challenge that groundskeepers face is finding ways to maintain and restore ponds and lakes without damaging the course. Manually draining, excavating and refilling the waterbodies can be a time-consuming, potentially destructive process that doesn’t always yield the best results. So, many professional groundskeepers choose to rely on specialized dredging equipment to make the job easier and minimize the risk of damage — smart. At GeoForm International, we help golf courses around the world keep their ponds clean with the DinoSix and Dino8 dredge, as well as our exclusive aerator. All of our machines are made in the U.S. and in-house at our machine shop. What makes our dredges for golf course ponds stand out is their lightweight yet durable build, which offers lower maintenance and transportation costs than other dredges. Their compact size also results in low-impact launches and minimal repairs to the area surrounding your pond. 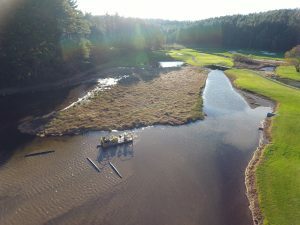 Despite its lightweight design and construction, the Dino6 is a powerful golf course pond dredge that will remove accumulated muck and debris without damaging the waterbody or disrupting its ecosystem. Contact us today to learn how our equipment can help with your golf course pond! What is Dredging and How Does It Work? Should I Dredge My Pond?